Maryland Gov. Larry Hogan has been diagnosed with an advanced, aggressive form of cancer, he announced Monday. Hogan, 59, revealed during a press conference Monday he has B-cell non-Hodgkin's lymphoma, describing the diagnosis as "shocking news to me" but appearing determined to fight his illness. He was diagnosed just days ago, he said. "I won't just beat this disease, I will fight it and beat it and be a stronger governor when we get to the other side," he said. 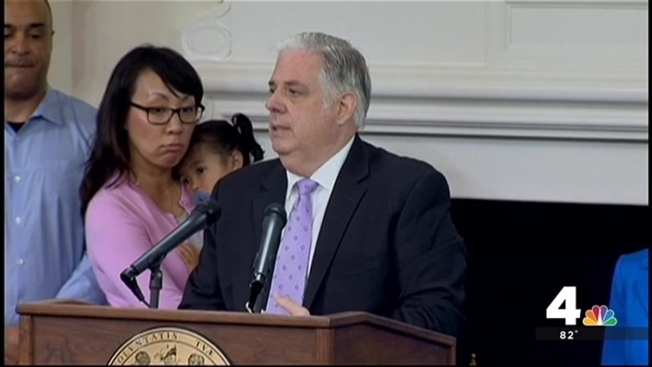 Hogan's revelation came five months to the day after he was inaugurated as governor. He said he told his family the tough news on Father's Day, and was surrounded by them in Annapolis when he made his public announcement shortly after 4 p.m. Monday. He said he has tumors that have spread through his abdomen and are pressing up against his spinal column. "On a stage [of cancer], we're not quite sure yet," he said. "It's at least very advanced stage III, if not stage IV." Non-Hodgkin's lymphoma is a cancer that originates in the lymphatic system, the body's disease-fighting network, according to the Mayo Clinic. Hogan said he was diagnosed after finding a lump under his chin while shaving. "They found 12 more of these things in my neck," he said. He said he had "20 or 30" more tumors in his core and groin area, adding he has been having many tests and procedures and that his team of doctors are treating his case aggressively. The governor says his doctors have told him he has a good chance of beating the disease and he will soon be taking time off to undergo aggressive chemotherapy due to the fast-growing nature of his cancer. "As far as the treatment, they want to be as aggressive as possible...." he said. "They’re going to put me in the hospital for four days and shoot me with intense chemotherapy in intensive care." He also said he expects to lose his hair as a result. "Most likely I'm going to lose my hair -- I won't have these beautiful gray locks," he said. "I may trim down a bit." He said he didn't know how it started or how long he has had the illness. "It just hit me in a very short period of time," he said. Most treatments for non-Hodgkins lymphoma are done without long-term hospitalization, Dr. Catherine Broome of Medstar Georgetown University Hospital said. "Aggressive lymphomas often respond very well and very quickly to the therapies that we prescribe," she said, describing drugs given intravenously once every three weeks on an outpatient basis. The governor appeared nervous at the start of his his press conference, but seemed to become more upbeat and confident as he went on. He cracked jokes but said, "It's a tough time to go through." Hogan said he plans to work as much as he is able, describing himself as a workaholic. He was greeted with laughter when he said that if he halved his work hours, he would still be working more than any other governor. "I’m going to miss a few meetings but I’ll have every capacity to make decisions," Hogan said. He said Lieutenant Gov. Boyd Rutherford will step up "even more," as will his cabinet. "The fact is, I'm just like the more than 70,000 people diagnosed with lymphoma every year who fight it, beat it and continue to do their jobs at the same time," Hogan said. Hogan said he has energy and not much pain, but not much of an appetite, either. "I've been feeling fine," he said.